Enrique "Kiki" Camarena grew up in a dirt-floored house with hopes and dreams of making a difference. Camarena worked his way through college, served in the Marines and became a police officer. When he decided to join the U.S. Drug Enforcement Administration, his mother tried to talk him out it. "I can't not do this," he told her. "I'm only one person, but I want to make a difference." Within weeks of his death in March of 1985, Camarena's Congressman, Duncan Hunter, and high school friend Henry Lozano, launched Camarena Clubs in Imperial Valley, California, Camarena's home. Hundreds of club members pledged to lead drug-free lives to honor the sacrifices made by Camarena and others on behalf of all Americans. These coalitions began to wear red badges of satin, red ribbons, as a symbol Camarena's memory. The Red Ribbon Week campaign emerged from the efforts of these clubs and coalitions. Today, Red Ribbon Week is nationally recognized and celebrated, helping to preserve Special Agent Camarena's memory and further the cause for which he gave his life. 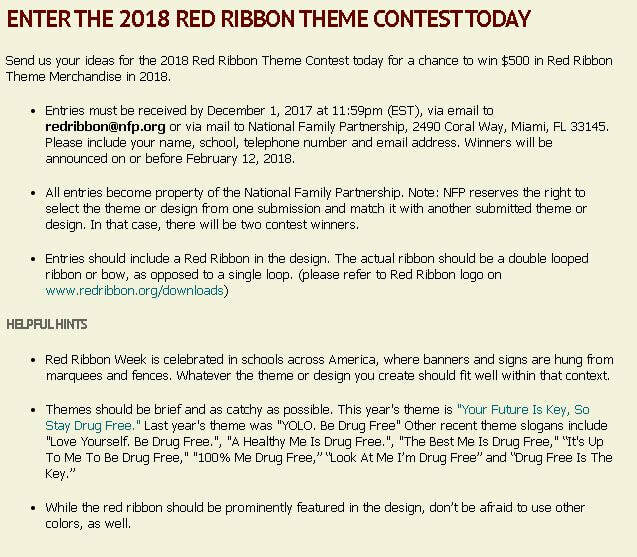 The Red Ribbon Campaign also became a symbol of support for the DEA's efforts to reduce demand for drugs through prevention and education programs. By wearing a red ribbon during the last week in October, Americans demonstrate their ardent opposition to drugs. They pay homage not only to Special Agent Camarena, but to all men and women who have made the ultimate sacrifice in support of our nation's struggle against drug trafficking and abuse. ​So be sure to join in the fun! Enter your vote in the form below! ​Vote for Best Student Wacky-Tacky! Vote for Best Staff Wacky-Tacky! Who Did the Best Throwback Thursday? CGCA Poster Contest for all grades! ​on the posters! This is not a contest to see who can draw the best joint, bong or marijuana leaf! The poster message should be obviously and genuinely POSITIVE! Hang them on your cork strips outside your classroom! ​Certificates and small prizes for 1st, 2nd and 3rd place. CLICK HERE FOR --> EXAMPLES OF GREAT STUDENT-CREATED POSTERS! Teachers print this pledge sheet and have students discuss the significance of signing it. Why do we make pledges to ourselves? I'm A Drug Free Kid - Elementary Coloring Contest! Winners will get certificates and small, but meaningful prizes! Students write about things that are important to say yes to! Teachers you will need to create an account at this website in order to access the materials - it is well worth the very minimal trouble.